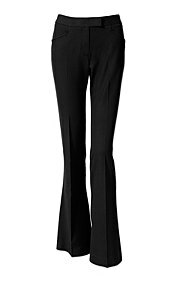 This week I have decided to continue on my quest for wardrobe staples and will focus on trying to find a pair of black dress pants. Now this was a tough decision for me to come to, not because I don’t need black dress pants (I really do, I honestly don’t own a pair of black pants that aren’t made of denim or corduroy), but because I absolutely HATE shopping for pants! Shopping for pants has to be one of the most frustrating experiences for me (as I know it is for many other women). Finding the right fit is sometimes next to impossible since I often have a hard time finding something in my size and if I do find a pair that I like the waist is usually too big and the legs are too tight! On top of that being on a tight $20 budget means that there isn’t much money lying around for tailoring and to be honest I hate even having to hem pants let alone get the waist taken in (plus I always have that debate as to whether I hem pants for heels or flats…unfortunately I can’t afford two of the same pair of pants right now). I’m going to try to find the best quality pants possible on my meager budget which means that it will be a long week of traipsing for trousers in many, many, sales bins (and probably the racks of a few thrift stores). 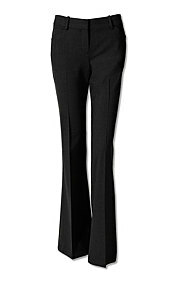 I’m really digging some of Theory’s dress pants right now so I’m going to use them as inspiration.